Yesterday I was crunching some numbers (yes, I am a consultant and we love Excel and PowerPoint) and realized that this week (i.e. in nine months) I will be reaching the mileage that I did for the whole of 2017, 857 km. I have done so using 30 sessions less; mainly due to the tough calendar of races I went through this summer. By the end of the year, I will have swum one million meters, 25% of them in the oceans, lakes and rivers of the seven continents. As an Open Water and Ice Swimmer, I would love to have more access to Open Water and Ice – it just makes sense. And contrary to popular beliefs, New York City is a great place to find both. But we all run pretty busy schedules, and it is difficult to squeeze as much beach time as I would like. 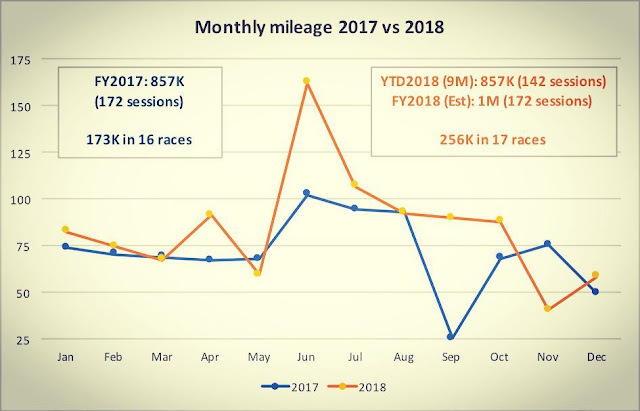 So, I swim 75% of my mileage indoors, with my Masters team. I know of some marathon swimmers that will look at this and think, “pfff 1 million ONLY”. I am a big advocate of quality training, and I’d rather do 4,000 intense and quality practices with swimmers faster than me, than 10,000 on my own at a slower pace. Besides, it is more fun! I recently watched an interview of Olympic champions Ferry Weertman and Sharon Van Rouwendaal and they have peaks of 90K/week (in 10 sessions). Assuming some ups and downs, vacation and tapering, they both are probably on a 4-million meters’ season. In the good old days, I myself had weeks of 70K, so I was probably close to the 3-million meters a year. However now, at the age of 37, and with many other responsibilities, I consider 1-million a very respectable figure. While I’ve done almost the same practices / swims during the first nine months of 2017 and 2018 (135 vs 138), my long swims in the summer have made the difference. As you can appreciate in the graph, April was a busy month (11K Swim Around Lido Key in Florida, 8K Freedom Swim in South Africa and 10K SCAR Stage 4 in Arizona in the span of three weeks), as was June (5K 2 Bridges in NY, 58K END-WET in North Dakota and 32K 8 Bridges Stage 5 in NY). I have talked about the post-race depression before. Last year, my season was pretty much focused on the Swim Around Manhattan, and I took it very easy after I was done with it (doing a Round-The-World trip, among other things). This year has been a bit different as the Continents Seven itself was an 8-month long project. So sure, I have felt tired physically and mentally after the English Channel and the Catalina Channel but I’ve had no choice but to keep going. I am five weeks away from the last leg in Antarctica, and I will spend the most part of November on an icebreaker. I just hope we find the right spot and weather conditions as early in the cruise as possible, so that I can get the Ice KM done, and relax and enjoy the rest of the trip. I am not a person to get injured often (touch wood), but my shoulders will surely appreciate the break from the pool practices. In any case, reaching the million meters’ mark will be a great closing to an unforgettable year.